There are very legends in film industries who got to the glorious path of fame on their own with their hard work and talent and became brands after that. But, there is NTR, who is dearly called Anna or NTVodu by his fans sorry devotees. He became a member of every family with his movies and then entered into politics which changed the fate of Telugu people throughout the world with the new identity of Telugus bought by him with his political entry and winning. He became the face of Telugu values. He not only came on his own but also uplifted the lives of many with his schemes in his rule. Nandamuri Balakrishna who is one of his sons has made his biopic in two parts and of which one part is released into theatres today which is directed by Krish. Let’s see how they made the life of legendary actor and greatest leader into the movie. Nandamuri Taraka Ramarao (Nandamuri Balakrishna) works as sub-registrar in Mangalagiri. With the hate and aversion towards corruption and non-working of his colleagues, he resigns his job and goes to Chennai with a letter of LV Prasad which he got earlier. He then tries very hard to get into movies and the rest is history. Nandamuri Balakrishana who acted in his father’s role is apt and he did complete justice to the character of NTR. He looked perfect in many of the scenes and his look has been very much taken care of. Vidya Balan has done a fantastic work for her debut in Telugu in the role of Basavatharakam garu. Nandamuri Kalyan Ram is nice in his father’s role. Prakash Raj and Murali Sharma are superb in the roles of Nagireddy and Chakrapani. Daggubati Raja is believable in the role of Trivikrama Rao so as Vennela Kishore for Rukhmananda Rao. Nitya Menon as Savitri, Pranitha Subash as Krishna Kumari shines in their limited presence. Every other actor shined in their roles of legends. NTR is a film made on the life of NTR and life has great proceedings which are written coherently in a superb screenplay. Dialogues are well written with a liking for NTR. Lyrics are superb. The songs composed by MM Keeravani who gave a great song Punyabhoomi Na Desham to NTR has composed nice songs which are very well supported by the lyrics. He has done fantastic work in creating or composing background score for this movie. Cinematography by Gnanvel Raja is superb and editing is fine. The art department has done terrific work in recreating the sets and locations. Production values of NBK Films are grand. 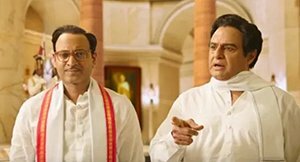 The biopic of NTR is made in two parts and first part NTR – Kathanayakudu is the story of NTR going into films and becoming a household name with this films and his announcement into politics. First part mainly goes into his films and its highlights which ends with Ramakrishna’s episode in a sad way. The entire second half takes to build NTR’s mindset to go into politics and ends with his entry. It would have been so hard for Krish to decide what to include and what not to include and he has done a good job in making this part in a good way. The proceedings and the length may be the flipside of this biopic but they don’t bore you. This movie on a whole tells the story of NTR with his values taking the front seat. 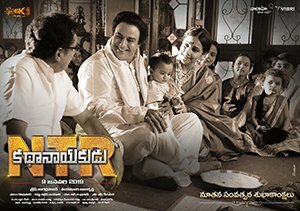 To sum up, NTR-Kathanayakudu is a film to watch to know the legend NTR and for the honest efforts the team made to bring the life and values alive.